The Right Fuelcard Company (TRFC), who runs our fab Foundation, has scooped the Diversity award in The Yorkshire Post’s Excellence in Business Awards 2017, where it was also shortlisted in the Outstanding Employer category. The prize is a fantastic endorsement for The Bayford Foundation’s unique recruitment and training programme – which taps into the skills of people, including ex-offenders, that other employers reject – and has ensured a highly diverse workforce. 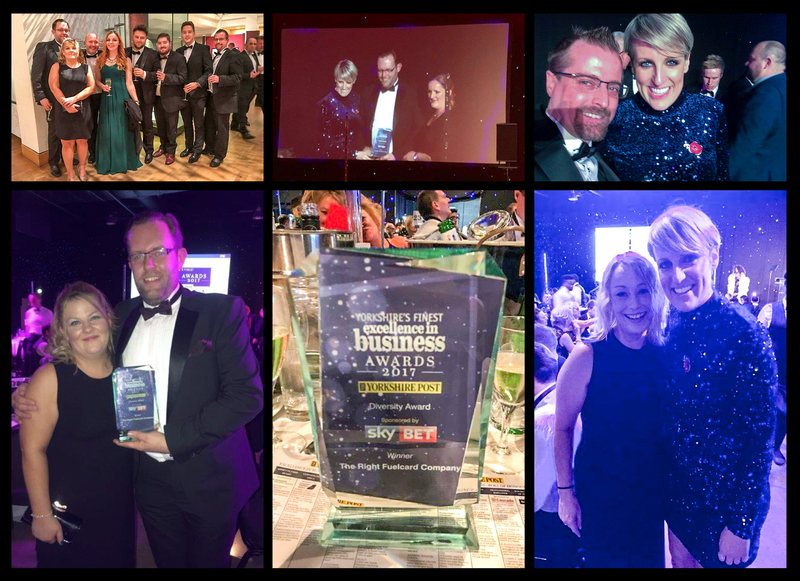 Foundation business manager, Nick Elletson, accepted the award from BBC Breakfast and Watchdog broadcaster, Steph McGovern, who was this year’s presenter at a glittering ceremony at Leeds’ New Dock Hall. The Yorkshire Post Awards celebrate and showcase the region’s best companies – with top organisations honoured representing a diverse commercial base. The event was attended by business leaders from across the region. The Outstanding Employer shortlisting recognised how we are shaping our industry in the critical areas of recruitment and staff well-being through our transparent and coaching led culture, which is resulting in continued success and growth. Listed 33 in the Sunday Times Sunday Times Best Small Companies to Work For 2016 with a 3 star accreditation – the highest star that can be awarded – for exceptional levels of employee engagement, TRFC recently passed its three year IiP reaccreditation with flying colours. The win and shortlisting follow both TRFC and The Bayford Foundation’s recent ‘Highly Commended’ honours in the Employment Related Services Association (ERSA) Employability Awards. The accolade recognises the opportunities we have created for the disadvantaged and long-term unemployed and our tireless dedication to inclusion. TRFC business director, Adam Walsh, said: “The latest results reinforce how we truly ‘look after the people who look after the business’ and we are immensely proud that employees refer to us as their ‘second home’. This entry was posted in awards, Bayford Foundation, Business skills, Diversity, Education, Employee Training and Development, Events, People Champion, Recruitment, Rewarding Success, The Right Fuelcard Company and tagged Adam Walsh, Bayford Foundation, Diversity, jobs, people champion, The Right Fuelcard Company, Training, Unemployment, Yorkshire. Bookmark the permalink.